Mike Trout agreeing to a 12-year, $430 million deal with the Angels is such a big deal that every team in baseball can’t help but be affected by it. The whole sport is altered by it. It’s the largest contract in sports history — with the highest annual average and highest overall total in North American professional sports history — and it is being given to hands-down the best player in the sport. It’s tough to get much bigger than that. But even though every team will feel the aftershocks of the deal, some clubs’ plans will be more altered than others’. So, in the wake of the deal, here’s a look at the nine teams most affected by the Trout extension. Not counting the Angels, of course. Fair to say keeping one of the greatest players ever to put on a uniform for the next 12 years will affect you somewhat. Here are nine others, ranked by how much they are affected. 1. Astros: The Astros have set themselves up rather well for the next half-decade or so as the best team in the American League West, but eventually, all that young talent is going to get awfully expensive. They might not be able to keep everybody. That makes their window open for roughly the next five-to-seven years. Had the Halos lost Trout two years from now, they might have (quite understandably) retreated in the three years after that, hoping to rebuild in the wake of his exit. Now? The Angels have every incentive to compete into the far future, and with the improvement of young talent in their system, they’ve got real chances to do so. The Astros are still the favorite in this division moving forward, but the Angels will be taking no steps back. 2. Phillies: Well, MLB doesn’t have to worry about Bryce Harper tampering anymore. As much fun as it might have been to watch, fans will never get to see Harper and noted Eagles fan Mike Trout in the same outfield unless it’s the World Baseball Classic. All is hardly lost, though. The Phillies set themselves up to be able to still spend big in the future with the way they structured the Harper contract, so expect them to be in on any free agent who hits the market. 3. Red Sox: The Red Sox might have been bidders for Trout, but the main way this affects them is how it sets a baseline for Mookie Betts, who will be eligible to hit free agency at the same time Trout would have, following the 2020 season. Betts is a year younger than Trout and, oh yeah, beat him out for the AL MVP Award last season. And he’ll only be a year older than Trout is now when he hits free agency. Is this what Betts will want from the Red Sox to extend his contract? How does this frame the thinking on both sides? Betts is now the only top-tier position player superstar who could be a free agent in the next two years. Trout’s signing might make him more likely to want to hit the market, not less. 4. Yankees: The Yankees don’t really have spots for any more outfielders for the next half-decade, but for Trout, they would have found one. Now that he’s unlikely to ever don the pinstripes, does this make them go harder after, say, Betts? Or Jacob deGrom? Or does it make them that much more motivated to sign Aaron Judge to a mega-extension in the next couple of years? (He’s not eligible for free agency until after the 2023 season, so they have some time, and he turns 27 on April 26, so keep that in mind.) All that said, the Yankees have spending power, it’s just that Trout’s not the player they will spend it on. 5. Mariners: The Mariners look on the cusp of a rebuild, even if they haven’t fully plunged in with both feet yet, and now there can be no uncertainty about it: Trout is a problem they’re going to have to deal with for a while. That can provide a certain clarity, both from a know-your-enemy aspect as well as a sense of how, exactly, the Mariners can frame their own competitive window. For the next few years, the Angels will not be taking a step back, and the Astros obviously aren’t going anywhere. This might not lead to more patience for a fanbase that hasn’t tasted the postseason since 2001 — the longest drought in the four major North American sports, but you can understand if the front office decides that an extra year or two of building might not be the worst plan. 6. Rangers: Much like the Mariners, the Rangers are a team that’s retooling and thinking long-term that now has a better idea of what the landscape looks like. They are well-positioned to let the Astros and Angels (and A’s) punch it out for a couple of years while building up their own roster back to 2010-11 levels, and with a brand new ballpark opening next year to help them usher it all in. And as good as Trout might still be in 2030, will he be $35 million good? The Rangers now know a division rival will be making a massive expenditure for a player in his late 30s. That’s likely to be even less common then than it is now. 7. Dodgers: They have spent as much as any team in baseball, and, for all their talent, they still don’t have that hands-down, no-doubt position-player superstar that you might expect for such a gaudy franchise and market. Trout re-signing with the Angels assured that not only will he not be that superstar, he’ll be haunting them from down I-5 for the next decade. The Dodgers are still the dominant team of the area, but, for the next 10 years or so, the best player (if not necessarily the most marketable) will reside 30 miles to the southeast. 8. Mets: The 2020 free agent market was going to be headlined by Trout, Betts and deGrom. With Trout now off the market, the intrigue surrounding deGrom, and whether the Mets will be able to figure out an extension, rises considerably. The market for a pitcher is different than one for a center fielder, obviously, but the public pressure on the Mets to get something done with him is already immense; imagine what it’ll be in a year. Trout’s the best position player in baseball, and now we know what he can get paid a year. So what about the best pitcher in baseball? 9. Cubs: The Cubs always felt like a potential suitor for Trout: They (theoretically, anyway) have the finances to pay for him, they have the wild fanbase he hasn’t seen yet and, heck, they even have a history of guys named Trout. A few years ago, it even became fashionable to imagine what a Trout-to-the-Cubs trade would have looked like. (History proved it would have looked bad for the Angels.) Now that Trout is seemingly off the market, the Cubs have a superstar of their own to take care of long-term in Kris Bryant. 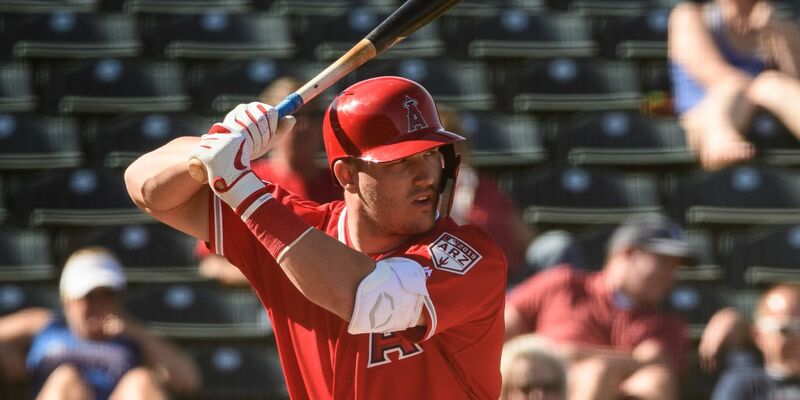 Bryant can hit the market after the 2021 season, which is a year later than Trout would have. The Cubs now have a ceiling for how much to pay, and Bryant has a baseline to work from.